Another FarmVille English Countryside character has been revealed, and it looks like she can party with the best of them. Olivia, the Pub Keeper, has shown herself to the masses and is ready for you to help her make her pub the best in England. 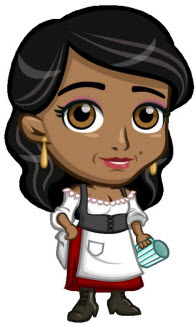 Zynga revealed Olivia to the FarmVille world with this: "I'm Olivia the Pub Keeper. I have all kinds of new recipes to craft, only available in the English Countryside! Just need a smart farmer to help me make this pub into the hottest spot in England!" It appears that the Pub will be a new crafting building in EC in which players create beers and wines. The amount of information and the speed at which it's being released has reached a fever pitch, so we can't be far from a release now. Check out the rest of our English Countryside coverage right here. What do you think of this brand new character and potential crafting building? How do you feel about Zynga's heavy focus on characters in this expansion? Sound off in the comments. Add Comment.